There is a continuing fascination in the life of Eric Liddell (1902-1945). He remains one of the best-known and best-loved of all British sportsmen. As the subject of an award-winning movie, Chariots of Fire (1981), his success in the 400m at the 1924 Olympic Games in Paris was powerfully portrayed. He was known as the ‘man who would not run on a Sunday’ and captured the imagination of a generation by his Christian character and by sacrificing fame and fortune to become a missionary in China, before his passing in a Japanese Internment Camp in 1945. This book is not a full biography of Eric Liddell. It is largely a sporting biography which weaves in to it Liddell’s background, Christian position and subsequent missionary work. 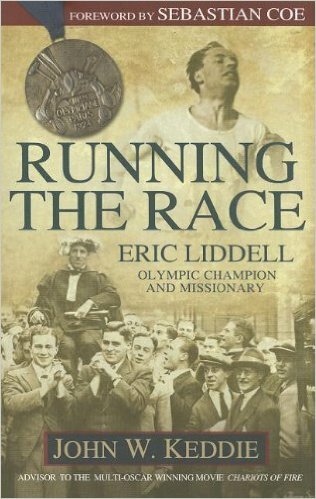 The author, who is the leading authority on Scottish track and field history and is presently a Presbyterian minister in Scotland, had a keen interest in Liddell from before Chariots of Fire. He was acquainted with Liddell’s first biographer, D P Thomson, to whom he gave some assistance in the production of the earliest full biography of Liddell (1970). He was subsequently involved with the writer of the screen play in developing the representation of Liddell for the award-winning movie Chariots of Fire (1981). Whilst the book is in the nature of a ‘personal tribute,’ it is from one who can speak with some authority on both the sporting side and Christian aspects of Eric Liddell’s life, as a Scotsman, a former athlete and rugby player, an athletics historian and an evangelical Christian. The biography produced by John Keddie is a readable, attractive, informative and accurate piece of work which will appeal to a wide readership. I enjoy biographies, especially Christian biographies. Eric Liddell is a well known name in the sports world, especially the running world. The movie Chariots of Fire was based on his life. I enjoyed this book, but I am not a huge sports fan. This book, especially the first half, was very sports heavy, so it was a bit slow going for me. It contained a lot of information about running, races, and stats. If you like that, I think you will enjoy this book. I enjoyed it and am glad I read it, but now I want to read a book about Eric Liddell that covers more of his life before and after running.